Our practice specializes in the diagnosis and treatment of diseases and conditions that affect the root canal system of teeth. We are committed to providing excellent endodontic care using the latest technology in an environment that is comfortable, caring and safe. 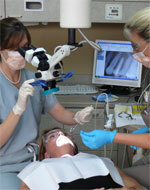 We are dedicated to helping our patients maintain their natural teeth in a healthy condition.